We proudly provide quality dental care to the Pleasanton, Dublin, San Ramon, and Livermore tri-valley area. Our practice offers full family dentistry, and accepts dental emergency problems as well. Some of our featured services are General Dentistry, Invisalign, Dental Implants, and Root Canal Treatment. Our mission is to use the latest technology and advanced family, cosmetic, and restorative dental techniques to help you and your family maintain a lifetime of healthy smiles. Our office’s warm, relaxing atmosphere and friendly, knowledgeable team members will allow you to feel completely at ease. Please join us, we’ll give you something to smile about. Our number one priority is our patients’ well-being. We implement all the tools available to make sure you have a comfortable experience during your dental visit. 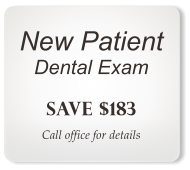 If you are looking for a great dentist in Pleasanton, call us today! We offer the most advanced technology in cosmetic dentistry. Teeth Whitening, Composite Fillings, and Full Porcelain Crowns are some examples of how we redesign our patients’ smiles.